MANILA, Philippines - Kapamilya viewers nationwide continue to tune in to the total transformation of eight celebrity performers in “Your Face Sounds Familiar,” the top-rating variety show of ABS-CBN that is set to serve up more exciting performances in its last three weeks. Based on data from Kantar Media, the program hit a national TV rating of 31.3% last Saturday (May 16), or more than double the points recorded by its rival program on GMA, “Celebrity Bluff” (14.6%). “Your Face” also triumphed last Sunday (May 17) with a national TV rating of 30%, or almost eight points higher than “Kapuso Mo, Jessica Soho’s” 21.7%. On both days, “Your Face” topped the list of the most watched programs in urban and rural homes nationwide. 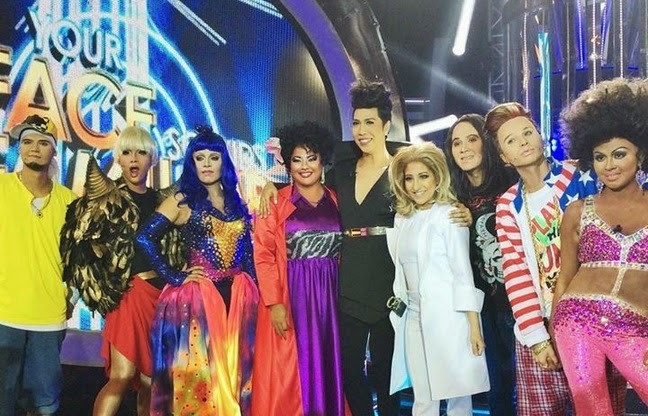 This weekend (May 23 and 24), “Your Face” will feature the transformation of Tutti Caringal as Ely Buendia, Maxene Magalona as Paris Hilton, Jolina Magdangal as Diana Ross, and Karla Estrada as Bonnie Tyler. Not to be missed are the performances of Jay-R as Alanis Morissette, Nyoy Volante as Rod Stewart, Melai Cantiveros as Fred Panopio, and Edgar Allan Guzman as MC Hammer. Whose performance will be deemed the best by jurors Gary Valenciano, Jed Madela, and Sharon Cuneta? Who will be the top scorer this time? Don’t miss “Your Face Sounds Familiar,” hosted by Billy Crawford, on Saturdays after “MMK” and Sundays after “Rated K” on ABS-CBN.